Your landscape lighting is the very first thing that makes an impression upon passers-by and visitors when they encounter your home. As a result, well-lit landscapes really stand out from the rest. With any type of lighting installation, there are some guiding principles that apply--and your landscape is no different. But just because there are some rules at play, that doesn't mean that you can't be a little...creative with their application. If you've been reading our blog for a while, you know that we're big fans of mixing things when it comes to lighting and decoration. So instead of having all your outdoor lighting fixtures glow at the same color temperature, why not try mixing it up a bit and install some different temperature bulbs in different fixtures? You may be asking "what exactly, is color temperature?" Color temperature refers to how "warm" (yellowish/reddish) or cool (bluish) a tint of white appears in light. It is a number that quantifies the appearance of light with the terms "warm" and "cool," which refer to subjective experiences like a warm flame or a cool winter sky. Color temperature is measured in degrees Kelvin or K for short. The most common color temperature, and the one many people are familiar and comfortable with, is 2700K. It's the yellowy-white light emitted by incandescent bulbs--although there are LED bulbs that render this color temperature too! However, more and more landscape lighting options are hitting the market in a variety of color temperatures, both warm and cool. You can use these different temperatures for interesting effects that will definitely draw the eye of your visitors. Landscape lighting designer Raymond Josephian is excited by the growing options in color temperatures. He likes to use cooler temperatures, around 3000K, for uplighting that highlights plants and trees and enhances their hues. An even cooler bulb of 4000K goes into a downlighting fixture and mimics moonlight. Warmer 2700K bulbs are perfect for use in areas where people will be sitting since it looks very inviting. Richmond-based Inaray Outdoor Lighting suggests that you create different landscape lighting styles, with varying kinds of light, based on where you live. 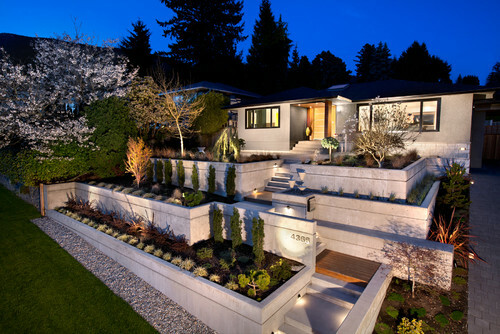 For example, city homes need light that illuminates outdoor living spaces while playing nicely with streetlights. If you live far away from the city, soft and subtle light layouts employing a mix of warm and cool color temperatures will work well and not create harmful light pollution. So much light on display here! The address is illuminated, as are steps to help people ascend safely in the dark since there are no handrails. Plants have uplighting that spotlights their beauty. The driveway offers guiding lights too. Finally, the front door has warm lighting to draw the eye in and let you know you are about to be welcomed. The cooler light used elsewhere works perfectly with the exterior material's hue instead of making it look discolored. Doesn't this just look so inviting? The waterfall looks otherworldly, the pool is stunning, there are step lights to help you see and then in the patio area, there's the warmer light (from a chandelier) that beckons you to towel off after a good swim and have a drink. This is a stunner of a lake house based just on the pool array alone, but the house is palatial too. The multi-level pool and hot tub (yes, there's a swim-up bar) are illuminated well. So is the path that leads you down to the lake. Uplighting of the trees in the background is also used to add even more effect. All of those lights are warmer than the pool lights because hey, that's the main event here! Oh, this is so cool and geometric! 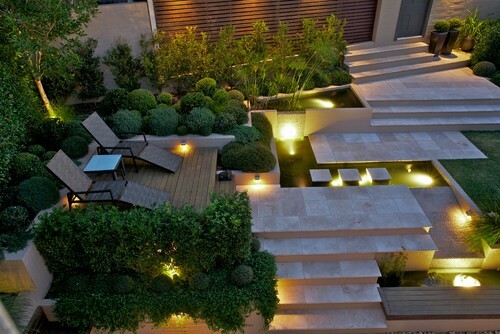 Lights shine into the water features, inside the shrubbery wall and on certain steps to help you get where you're going. The wall in the background is grazed with warm light and the plants by the door are also given a little spotlight. Different temperatures of light work well together. This lovely pool area is from a fellow Atlanta-based company! The plant uplighting spotlights the different shapes and colors of each one, even the little tree on the left near the seating area. I spot a path light on the right and the back wall is also lit, helping to show the 'end' of the area. 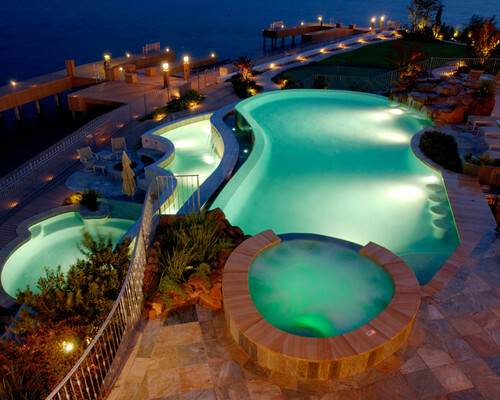 But oh, that pool--it uses color-changing LED lighting! Everything about this photo is meant to draw your eye up! 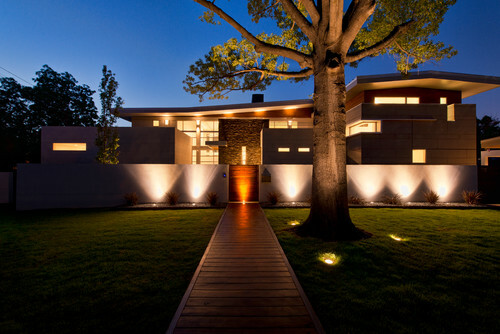 The big tree has dramatic uplighting from a trio of lights buried in the grass, the exterior wall reminds me of spotlights shining on a red carpet event and then the warmer light on the wood gate makes it clear that this is an entrance while also calling attention to the texture. I do think the wood path to the door could use a little more path lighting, though. 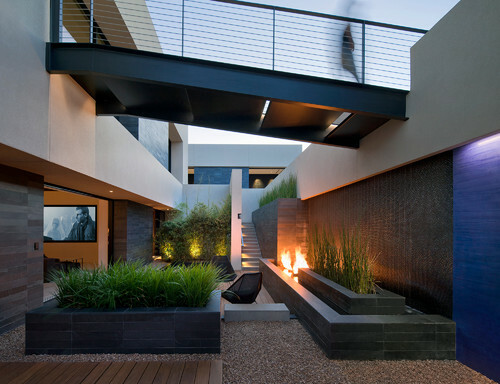 The sleek and bold lines of this contemporary house are accentuated with varying sources of light. The shrubbery wall has uplighting in a warm color temperature, while the dark blue accent wall gets illuminated with cooler light. As you may have guessed, fire is on the warm end of the color temperature spectrum. 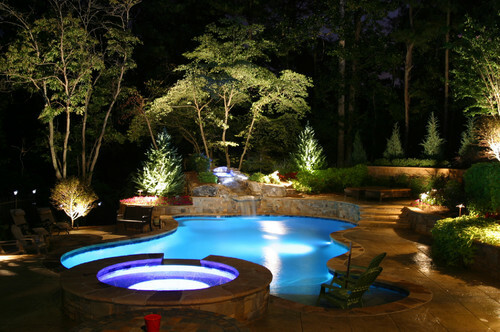 You don't need a huge backyard or a pool to use different temperatures of landscape lighting. 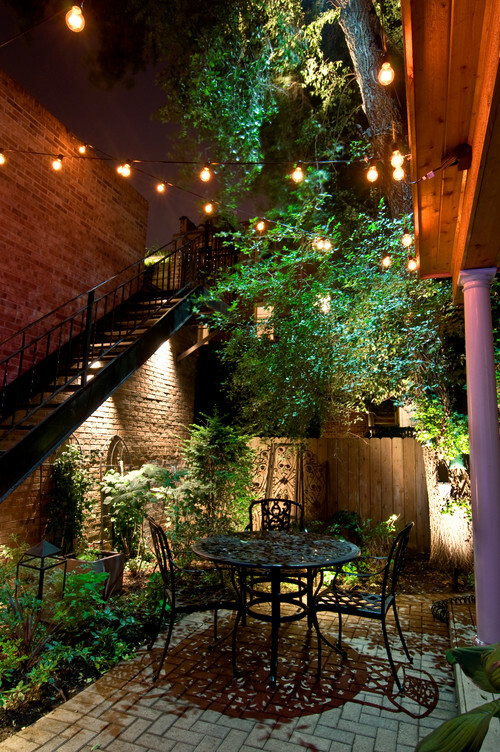 This cozy patio has sparkling warm bistro-style outdoor string lights, the trees are illuminated at varying points and the brick wall is grazed with cooler light to add more visual intrigue. Check out the shadow pattern that the patio set makes! As you see in the photos above, using landscape lighting with differing color temperatures is like a symphony: many very different instruments coming together to create one beautiful work. Why settle for just a soloist when you can have the whole symphony? Create your own symphony with landscape lighting. Need help finding the color temperature on light bulbs for your outdoor lighting? We have a guide to reading the Lighting Facts label. 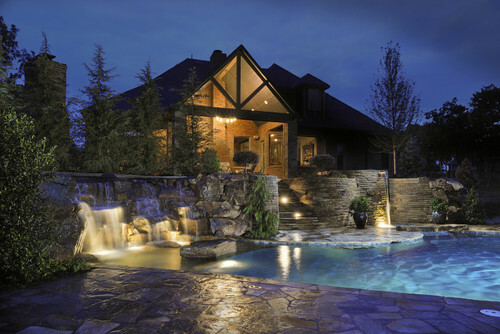 Need help picking out landscape lighting? Contact us, get in touch on social media, live chat with us on the website or call us at 1-866-688-3562. Photos from Houzz. Photo credits in the alt tags.